Highlights from the College of Education’s Homecoming celebration include the induction of five alumni to our Hall of Fame, presentation of the first Outstanding Young Alumni Award, and sponsorship of an alumni tailgating tent. Joined by their families and several past inductees, the following alumni were inducted to the Hall of Fame: Lori Ann (Duncan) Campbell ’90; Greg P. Gardner ’91; Lois J. (Hurston) Gaston, Ph.D. ’84; Teresa (Lucie) Thompson ’78, M.S. Ed. ’87; and Beverly J. Trezek ’88. 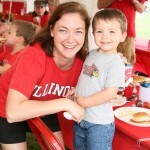 In addition, Rebecca Mullen ’05, M.S.Ed. ’10, was presented the Outstanding Young Alumni Award. Biographies of these honored alumni and photos from the event are available. The College of Education Alumni Tailgating Tent was THE place to be before the game! Nearly 200 alumni, faculty, staff, students, and friends of the college attended the event. Check out our photo gallery—you might spot a few people you know! We look forward to seeing you at next year’s Homecoming celebration!